Follow the story about underdogs with big dreams and third-rate specs just struggling to survive, and craving for success for the career they’re low qualified. And the longtime friendship blossoming into a romance between two immature friends Ko Dong-Man (Park Seo-Joon) and Choi Ae-Ra (Kim Ji-Won) whose childish dynamic hasn’t changed despite reaching adulthood. My sister has been telling me to watch Fight for My Way for quite some time now, but I didn’t watch it until lately. The first time I watched this drama, I really have no idea where this film would get me to. As the story went by, I started to understand what this drama is all about. Basically, Fight for My Way is about life, friendship, and love. 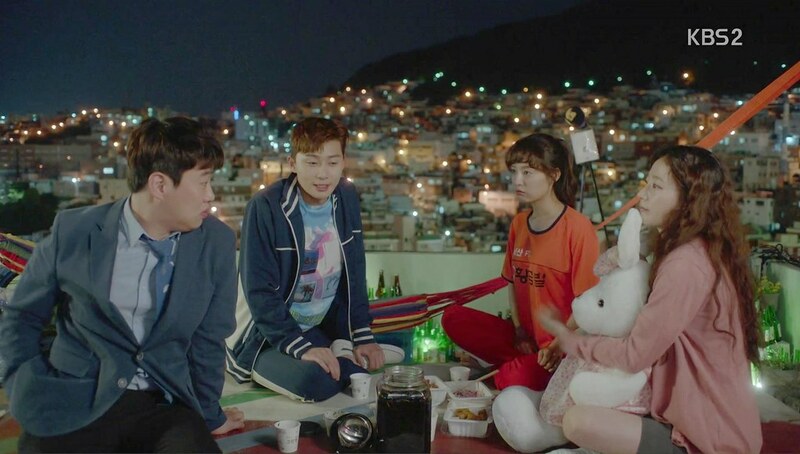 After watching Reply 1988 (2015-2016), I am pretty excited to watch another friendship drama, where the main characters have known each other since childhood and they developed a very strong bond. However, unlike Reply 1988, Fight for My Way gave more romance than family matters. It’s a plus point itself for audiences who are looking for romance drama rather than family drama. Although I was feeling a bit bored in the beginning, as time passed, I started to like this drama. Park Seo-Joon as Ko Dong-Man and Kim Ji-Won as Choi Ae-Ra have made a very good chemistry between them, either as best friends or as lovers. Their interaction is so sweet and so real. It’s more than once that their interactions are not only sweet but also very funny. After watching Kim Ji-Won doing great in Descendants of the Sun (2016), it’s no doubt that she would do great in Fight for My Way too. Although Kim Ji-Won was very good at portraying her character, I have to really praise Park Seo-Joon. In Fight for My Way, he played the role of a taekwondo player and later became mixed martial arts fighter. In my opinion, it wasn’t an easy role to do because he has to shape his body and did all those taekwondo kicks, especially Ko Dong-Man’s signature roundhouse kick. If Park Seo-Joon didn’t really practice it, his gesture wouldn’t look perfect, unless he is a taekwondo player himself in real life. So yeah, I think Park Seo-Joon really did great in portraying his character. However, the downside is perhaps the final battle. I was expecting a more intense battle between Ko Dong-Man and his long-time rival. Instead, the resolution seemed to be too flat and very anti-climaxing. I kind of disappointed. I am not a fan of mixed martial arts but I did expect an intense fight, though I understand that a real mixed martial arts fight could be gruesome and I don’t want to watch it at all. Still, I think they could do a better battle. Ahn Jae-Hong and Song Ha-Yoon portrayed their character really well. I’ve seen Ahn Jae-Hong before in Reply 1988 and even before, he did well in portraying his role. As for Song Ha-Yoon, this is the first time I’ve seen her. She’s doing great in playing the role of an innocent and quirky girl. She definitely looks innocent and quirky. The chemistry between Ahn Jae-Hong and Song Ha-Yoon is indeed very good. They played Kim Joo-Man and Baek Seol-Hee who happened to have dated for six years. You can see how much Song Ha-Yoon’s Baek Seol-Hee loves Kim Joo-Man. However, there are a couple of times that I found their romance acts a bit cheesy or even too cheesy. But as the series went by, their love story was put on a test and things got more interesting. Ko Dong-Man, Choi Ae-Ra, and Baek Seol-Hee have known each other since childhood, whereas Kim Joo-Man has known Ko Dong-Man since high school. Baek Seol-Hee eventually dated Kim Joo-Man and they’ve been together for six years. These four friends referred themselves as the crazy fantastic four. However, I think they lack interaction. Surely the four of them have their moments together not just once but a couple times. They indeed have an interesting friendship. They support and care for each other. I just hope that I can see more interaction between four of them. But since Fight for My Way is more of a romance, the romantic scenes were shown more. Each character has their own problem to solve, including their love life. Most importantly, we can learn from these crazy fantastic four that true friends always have your back. They will support your dreams, defend you, and knock your head to wake up. You might face a failure but true friends will always cheer you on and keep your spirits up. Although I wasn’t too fond of the story in the first two or maybe three episodes, I eventually grew to like Fight for My Way a lot. The storyline is indeed very good. Since Fight for My Way is about four characters who were fighting for their way in this harsh and thrilling realities of life. They experienced various hardships in their careers, romances, and even families. One thing for sure that we can learn from Fight for My Way is that life is not always easy all the time, but you must never give up. I like how they told us the story of four young people who tried to survive the world. Perhaps not just survive, but also be an excel in whatever they’re doing. These characters tried to achieve their own dreams but as always, not everything in life happened smoothly, and therefore, these characters have to struggle too. Each character has their own stories to tell. Combined, they made a good collaboration of laugh and sweet moments. This heart-warming and romantic story surely has more than a couple of times hilarious scenes. 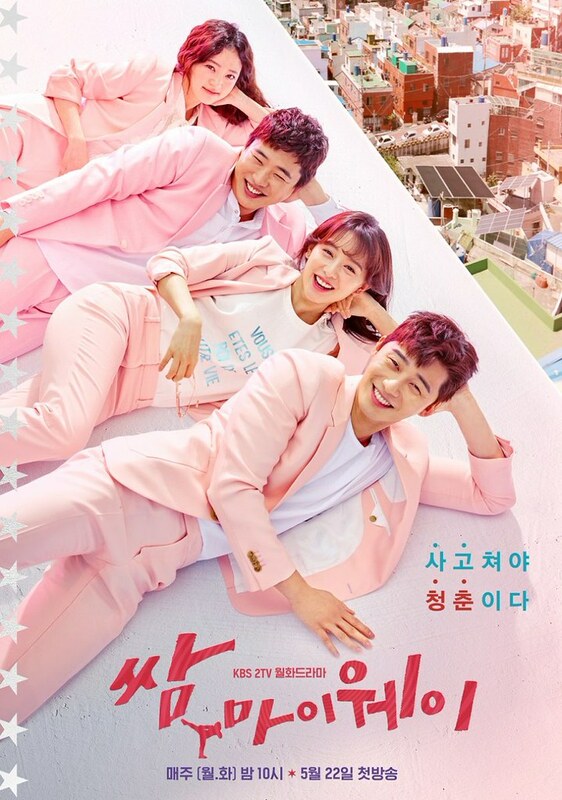 Fight for My Way gave us a third party more than once because there are four main characters. However, not all third party came out strong as I was hoping for. These third party characters eventually ended up wasting the time because they didn’t put a strong fight. Regardless, everything was redeemed by the love story of Ko Dong-Man and Choi Ae-Ra. It’s sweet, it’s funny, it’s heart-fluttering. I have to praise the production team of Fight for My Way. The house, the clothes, and other attributes used in the drama are not too fancy because they wanted to present the life of ordinary people who still struggle with achieving their dreams and surviving their life. The characters’ lifestyle and fashion style still portrayed the life of people who still struggle with paying their house rental costs. I always like how Korean dramas are always able to pay attention to details. The smallest wound, the food, or the decoration in the house. Everything that was put in the drama is there for a reason. Thus making the story of the drama more realistic and more real. All in all, Fight for My Way has given us a very good scenario. It’s not always great because sometimes I felt bored. However, the ending of this drama is satisfying. Not the kind of the thing that I usually said. Fight for My Way was beautifully packed. The story is realistic and heart-warming. I thought this drama would be just like any other romantic comedy Korean drama with cliché narrative and story. However, this drama proves otherwise. It’s different from other Korean dramas because it used the story of normal people. How they live, how they dream, and how they love. If you’re looking something fresh, Fight for My Way is definitely the right drama for you. It’s sweet, it’s funny, it’s even sad at some points because life is not always happy. Fight for My Way is a very enjoyable drama. I really enjoy watching it. I give Fight for My Way 8 out of 10 stars.